Sarge was born in the back of the car on the way to the vet's office. He was a big puppy and he was not breathing. Luckily John had recently read an article about CPR being used on animals and he decided to give it a try with this puppy. Lucky for us it worked. Sarge survived no worse for wear and basically immersed himself in the activity of eating for the next few years of his live. 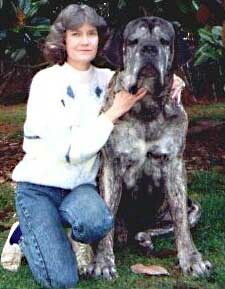 He quickly outgrew his littermates and went on to become one of the largest mastiffs we've ever seen, let alone produced. 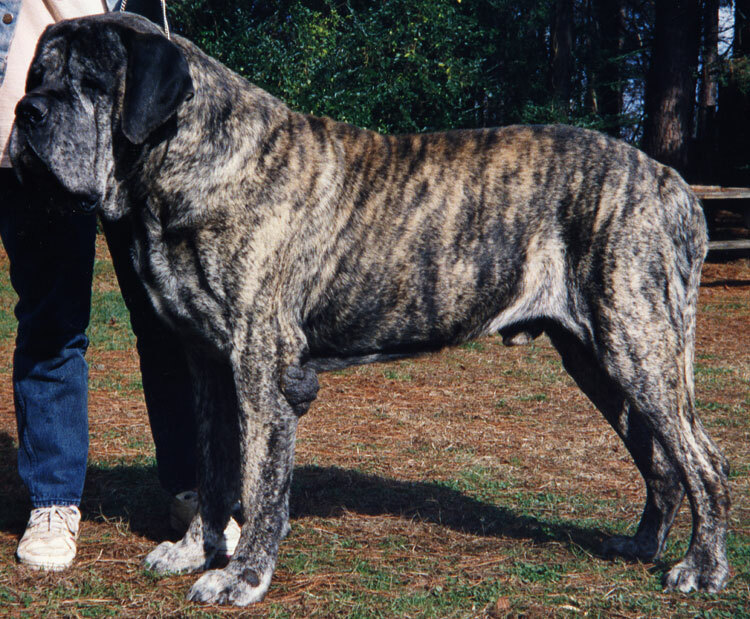 He was right around 36 inches tall and was 200 pounds at 12 months of age. In his maturity he was probably 300+ pounds. 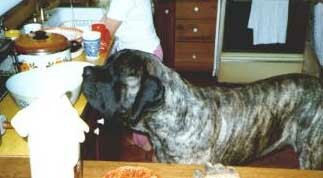 Probably because of his size, Sarge was very laid back and easy going. This shot to the right shows him taking advantage of his easy access to the kitchen counter as a puppy. Sarge was one of Donna's favorites and she chose to pose with him for her "Meet the M.C.O.A. Board" picture. Sarge only needs one more of his offspring to get a championship or CD to become a member of the M.C.O.A. Hall of Fame.